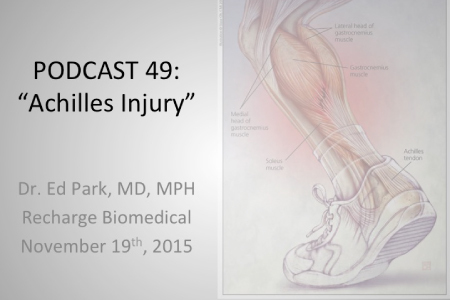 In this 24 minute live webinar, I review a few cases of Achilles tendon injury while taking TA-65 or Recharge. We review possible mechanisms and conclude that there is probably no direct link but that care should be taken to listen to one’s body when signs of injury occur. On the other hand, repair can be accelerated if proper rest is allowed. This 46yo power lifter and actor, Guy, calls in and shares his experiences with Achilles injury and we get to watch Marty do 18 pull ups at age 71. I am sorry to have missed the Webinar, but I look forward to viewing it on YouTube sometime soon. I’m a fairly active runner, and while I have not injured my Achilles tendon, I have had a few mysterious strains and pulled muscles while taking TA-65, the first one being a pulled adductor magnus muscle in my left leg over a year after I started taking TA-65. I was sitting on a couch at the time — doing nothing! — when I adjusted my seat and felt that unmistakable “RIP!” Impossible to know whether TA-65 played any role in the injury or the recovery, or if it was just old age striking back at me. I have been taking TA-65 for 5 years with no tendon problems. In addition to consulting with traditional medical doctors, I also work with intuitive practitioners one of which reported that the TA-65 was making the organs in my torso younger but not as much improvement on my tendons due to lower blood circulation in those parts of the body. As someone who lifts weights regularly for exercise, I also take a number of nutritional supplements with the hope that they will compliment the effects of TA-65. Quantum mechanics is relevant here as the human body shifts between energy and matter similar to sub-atomic particles. When we sleep, the body moves into the energy state, and during the work day moves into the matter state. In addition, the human baby (sleeps a lot) spends more time in the energy state while the elderly (difficulty sleeping) spends more time in the matter state. More time in the matter state corresponds with crystallization of the body and hence less flexibility, i.e., as we age the body crystalizes and tends toward less flexibility while the young spring back from physical impacts due to their greater flexibility (non-crystal state). For those who wish to understand this better, I recommend the book “Wisdom of the Gemstone Guardians” by Michael Katz, however as a warning, this book is of a mystical and not scientific nature. If you are looking for “evidence based” information, this book is not within that category.